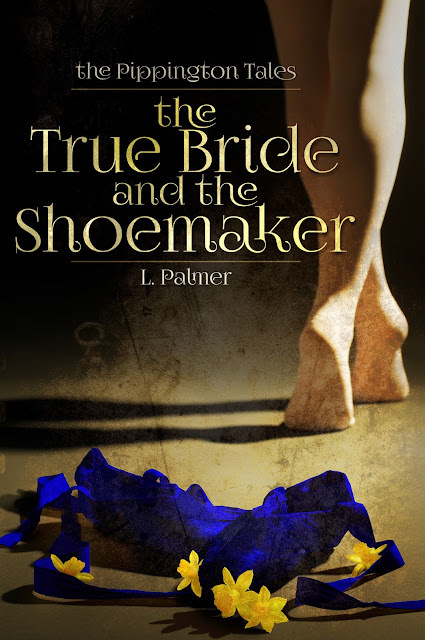 Shoemaker Peter Talbot needs a little magic. Cheap, factory made, shoes are putting him out of business, his nagging sisters will never let him rest, and his efforts to find true love are constantly thwarted by worldly fickleness. However, the gift of a wild primrose and a shipment of rare griffin skin are about to change everything...When beautiful handmade shoes begin appearing in his shop every morning, Peter is determined to find the source. What he finds instead will be far more exciting and wondrous than he could ever imagine. Pippington is a town somewhere between the 1910’s setting of Downton Abbey and the magic of Storybrooke in Once Upon A Time. Here, the magical is possible, but hardly sensible, and better left ignored. However, magic is difficult to ignore when pumpkins start turning to carriages in one’s backyard, one’s brother appears to now be a frog, or completed shoes start appearing on the shop counter after only being imagined the night before. If we were to visit Pippington as tourists, what would you recommend that we see or do there? What you do while visiting Pippington depends on how much you want to spend. If you want to rub shoulders with the upper class, I’d recommend dinner at the Gormand and an evening of theater and dance at the Morveaux. Talk to the right people, you might be invited into the inner circle of Mrs. Petunia Ophombauch, and she will introduce you to the exclusive marvels of high society. If you’re more interested in a rougher crowd, I’d recommend a day at the dragon races, followed by dinner and some good dancing at McBriar’s. Just make sure you’re ready for a brawl. No matter which crowd you choose, make sure to visit Talbot’s Boots and Other Footwear and order a pair of shoes. Your feet will discover a new world of beauty and comfort. What dangers should we avoid in Pippington? The dangers of Pippington are generally hidden. Magic is rampant throughout the city, but not discussed in polite society. The dangerous sort of magic may come in the form of an old woman asking for a coin, a charming stranger, or a secretly enchanted hat. In other words, you don’t find danger – danger finds you. Is there a distinct or unusual type of food or meal that we might be served in Pippington? Pippington’s cuisine is close to Earth’s, but the Gormand and other restaurants serve a fine griffin steak. The steak is best medium-rare with a spicy mustard sauce and roasted potatoes. What types of weaponry or fighting styles are common in Pippington? Many citizens in Pippington are partial to a classic brawling style, using punching, kicking, and biting. Those with magic, however, train in secret for sorcery battles involving conjured flame, tossing about objects, and other magic-based methods of mischief and injury. Some with magic prefer practicing how to turn people into frogs. What types of vehicles, animals, technology, etc. are used to travel in or to Pippington? Attempts have been made to expand the use of dragons to a means of transportation, but the high expense of maintaining a dragon, and the likelihood of falling without proper harnessing, has made this prohibitive. In fact, a recent law was passed to ban riding dragons without proper licensing of both dragon and rider. Most citizens use the public trolley system, private motorcars, bicycles, a classic horse and carriage, or their own feet. There are rumors of women using brooms, but these remain unconfirmed. What types of plants, animals, or sentient races might we encounter in Pippington that we don’t see on Earth? In addition to dragons and griffins, any creature which appears in a fairy or folk tale in any culture on Earth might make an appearance. Mermaids, for example, are rumored to live in far-off waters, but none have been found in the local lake. What role, if any, does magic or the supernatural play in the lives of people in Pippington? If there is magic, please give some examples of what it involves or how it’s used. Magic is similar to another wavelength in the air – similar to sound and light waves. Some people are more attuned to magic, and you can manipulate the air through sound – whistling, singing, music – or attach the magic to an object, allowing for specific spells. Those in the underground magic social circles who can do air-based magic look down on those who can only do object-based magic. Are the days of the week and months of the year the same in Pippington as on Earth? What holidays or special events are celebrated regularly there? Time in Pippington passes in the same fashion as Earth. In the summer, the citizens of Pippington celebrate Abeyance Night, enjoying peace in the city with fireworks and parades. In the winter, is High Winter, where families come together to feast and enjoy each other’s warmth. Is there a particular religion practiced in Pippington? Please describe what it involves. There are several religions practiced in Pippington, including some underground religions involving magic. The general citizenry participate in Dalthonism. The Dalthon is an oligarchy of five gods who embody five virtues – courage, honesty, charity, patience, and virtue. These gods dress in simple clothes and represent the everyday person. They are in eternal battle with the Carricks, who represent five vices – fear, falsehood, hatred, glutton, and lust. These gods dress in finery, using their glamor to draw people into their traps. If you follow the Dalthonian Path, your afterlife will be in a Paradise, where you will live in peace. If you follow the Carrickian Path, your afterlife will be in an endless maze of darkness and misery. Most citizens of Pippingtons participate in surface level church activities – weekly sermons, periodic charity drives involving baked goods – and give little thought to the deeper questions of their religion. What is the political or government structure in Pippington? Who is in charge there at the moment, and what kind of leader is he/she? Pippington is part of Barthan, a democratic republic ruled by a generally elected president and parliament elected prime minister. About two-hundred years before The True Bride and the Shoemaker, Barthan was a monarchy ruled by an aristocracy of magic-users. With the invention of the gun and other devices, the common class revolted and established rule by the people. Great efforts were made to erase traces of magic in the more populated areas, and the survivors with magic moved west to the Surris Mountains. In the Surris Mountains, magic is practiced freely, and Barthan leaves the citizenry alone. In return, residents of the mountains support the Surris Rangers, who monitor and capture those are doing harm with magic. Those who are dangerous to humankind are imprisoned in the Culparr Mines. In Pippington, there is a mayor and city council, with each member elected every four years. While the mayor and city council are respected, most of society listens to the opinions of Petunia Ophombauch and her societal column in the Rosetown Journal. Reputations live and die by the stroke of Mrs. Ophombauch’s pen. All stories and characters I write are a combination of experiences and people I have met. While the world is long ago and far away, the characters are grounded in real emotions and every day experiences. For example, in The True Bride and the Shoemaker, Peter goes through the same romantic rejection most young adults have experienced. What literature influences the world of Pippington? O. Henry’s New York (see The Gift of the Magi) and the less bleak parts of Dickens’ London. What, if any, “hot-button” or controversial topics do you touch on in your book? Dating. I find it’s a hot-button issue for many single adults. L. Palmer has spent many years traveling fictional worlds and building tales of grand, epic adventures. When she was in the midst of a grand battle between two ogres and a stegosaurus, she stumbled upon the world of Pippington. Dreams of wizard duels and clashing armies gave way to motorcars bumping down old city lanes and fairy godmothers disguised as high-society gossips. Here, she found a new literary home. In between exploring the hidden lives and magic of Pippington, L. Palmer lives among the mountains of Utah and attends graduate school at Brigham Young University. 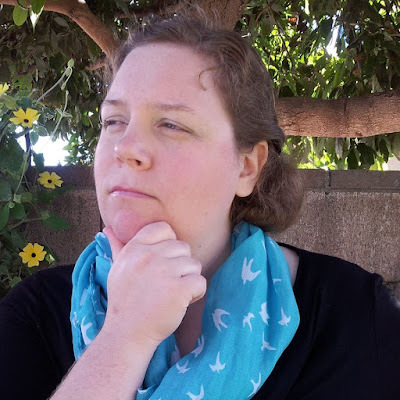 She developed her imagination and adventure skills through growing up in Girl Scouts, working for ten years at resident summer camps, teaching high school English, attending and working at the University of California Santa Barbara, and reading great books of fantasy and magic. The True Bride and the Shoemaker is just the beginning of many tales to come. Where, and in what formats, can we purchase your book? I hope you all enjoyed the trip to Pippington. Questions about the world or the book? Ask them in the comments and the author will get back to you! Please join us again next Monday for a trip to Bitter Thorn Grove, in Realm Explorers Part LXIX!